The Rimba Orangutan Ecolodge perches on the banks of the Sekonyer River in remote jungle in Central Kalimantan, Indonesia. The lodge provides a base to explore the surrounding rainforest and the nearby Tanjung Puting National Park, one of the last remaining places to view orangutans and many other unique fauna and flora in their natural environment. The Rimba Orangutan Ecolodge’s mission is to provide a unique eco tourism experience to its guests. The company that runs the lodge has its own Eco Certification System and increasing sustainable and environmentally responsible practices was very important to them. The brief to John Nicholas from Solar Power Indonesia was to decrease their reliance on diesel generators for electricity generation as the lodge is not connected to the national electricity grid. There were three main challenges to this installation: the remote location, the local wildlife and the proximity to a tidal river. All components had to be shipped by boat from Bali to the port of Kumai in Central Kalimantan and then a further 2 hours up the Sekonyer River to the Rimba Orangutan Ecolodge. The local macaque monkeys were fascinated with the solar panels and it was feared that they would damage the solar array. The solution was to install a low voltage protective electric fence around the solar array to deter the curious local inhabitants. Another consideration was its proximity to the river; the timber lodge is built in a series of adjoining elevated pavilions to avoid flooding from the tidal river. Housing the battery bank was a challenge; a metal bracing structure was purpose-built to disperse the weight of the batteries and to raise them off the floor in order to protect them from tidal inundation. 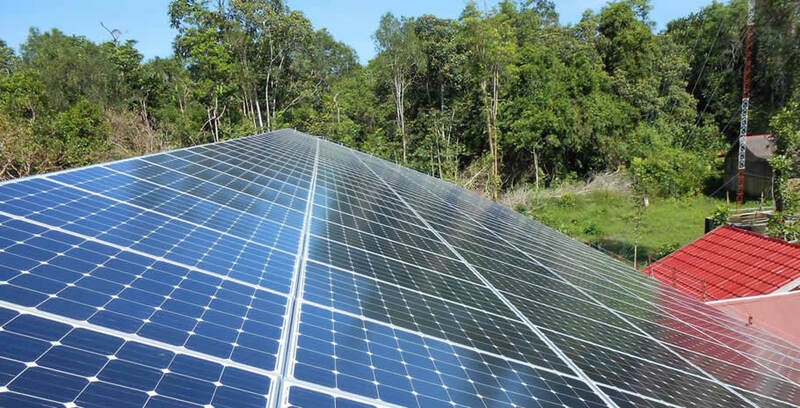 The Rimba Orangutan Ecolodge are extremely pleased with their new solar power system and are able to boast on their website that they are now over 90% solar powered. The system is monitored from Bali and Australia and system adjustments can be done remotely. Return on investment (ROI) on the new system is estimated at between 5 and 6 years. This does not include increased comfort to staff and guests leading hopefully to increased production and satisfaction respectively. Other key factors are an estimated annual saving in running costs of AUD 100,000/annum on the old diesel generator which ran for 18 hours a day and a saving of an estimated 70,000 litres of diesel into the atmosphere.